Recognising the outstanding practices in education that raise awareness and support implementation of multicultural initiatives. At Yarram Primary School, global and multicultural education has been on the agenda since 2000 when the school first participated In Harmony Day as part, of the Federal Government's Living in Harmony initiative. This proved to be an enjoyable, hands-on way for students to become aware of the world outside Yarram, Building on the success of these activities, the school found innovative ways to immerse the students in another culture. 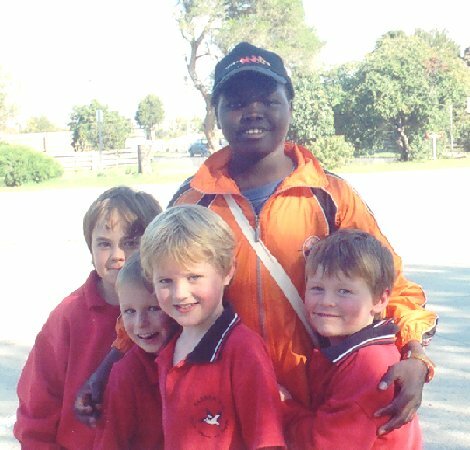 In 2006 the school hosted a group of twelve African refugees for one week in the Yarram community. This involved members of the school community taking the refugees into their homes and bringing them to school each day to share activities Involving music, cooking, art and cultural exchange. The refugees shared some of their stories with the Yarram community. Other community organisations such as Rotary, the Historical Society and the Maritime Society were also involved in this initiative. This intercultura! experience was so valuable that It was held again in 2007. culminating In an event which raised funds for a hospital in Ethiopia. From 2008 the school extended its global and multicultural citizenship program to encompass a relationship with an Argentinean school, making use of Information Communication Technology (ICT) skills such as video conferencing. Students became e-pals with Argentinean students and shared cultural interactions, and Ihe Yarram students produced video clips of Melbourne life to share with their counterparts In Argentina. This global relationship continues with students talking to each other via skype regularly. The school has gone on to deepen their work in global education with their involvement in a research program, the Interculttiral Understanding Field Trials with the Department of Education and Early Childhood Development. They are using this opportunity to extend their understanding of their local Indigenous community. Cultural awareness and understanding in the education system in the region commenced in 1991 with the appointment of head-teacher Wendy Bouker at Carrajung Primary School, a small two-teacher rural school thirty kilometres north of Yarram. Wendy had experience teaching a range of nationalities and cultures during her years at Melton and North Fitzroy Primary schools, and recognised the social implications of providing children with an understanding and acceptance of a diverse range of cultures and philosophies to enrich their life, especially as they grew into adults making their way in a multicultural society. At Carrajung, Bouker’s social education in a school of some twenty children living in a somewhat isolated rural area was initially more concerned with giving the children a greater awareness of life beyond the hills and forests of the Strezelecki Range. The annual school ‘camp’, for example, used to be held nearby and even on the school’s playground - Wendy took the elder children to Melbourne, to travel on a tram, to visit Lygon Street and, a favorite for the kids, Chinatown. The excursion was not without concern, indeed disapproval, from some parents, the adage being “you shouldn’t wander too far from home”. The children were billeted at Wendy's previous school, North Fitzroy Primary, where they integrated with a range of cultures, including Australian indigenous, for several days. On joining the staff of Yarram Primary School after three years at Carrajung (the school is now closed), Bouker continued her direction of promoting awareness of other cultures, and embraced the Harmony Day initiatives of the government. Living in a town and local rural community of 2000 predominantly white anglo-saxon inhabitants, Wendy searched successfully for people with non-Australian backgrounds to speak and work with the kids (making pizza was a favorite of course), but one day was hardly sufficient to endorse a cultural awareness. The indigenous community of nearby Latrobe Valley were approached by the school cluster (schools in the area) and several short-term one-off programs were established with moderate success. Wendy Bouker recognised that a one-day attempt to instill cultural awareness was totally ineffective. After extensive negotiations with community leaders in Melbourne, and with parents, in May 2006, Yarram Primary hosted twelve west African refugees, of ages fourteen to seventy, who were billeted out by local families. They came to the school each day, and presented fascinating classes in their culture, geography, cooking, and music. The children loved it, and the Yarram community embraced the visitors. Led by a great humanitarian and remarkable man, Alan Herman, a white South African who is a pastor at a church in Reservoir, the visitors also gained immensely from the cultural exchange and many friends were made. The program was repeated the following year with equal success. The funding for the unique program was totally borne by the visiting group, the school, private contributions and the Yarram business community. It would be reasonable to suggest that the concept was not, initially, totally embraced by the school because of logistic and financial concerns but was supported by the parent’s committee. Any concerns were soon resolved, and Yarram Primary School was now a leading educational institute fully embracing multiculturalism. The passion continued within the school, not just with the established Harmony Day but throughout the teaching year with individual one-off programs, and within the school’s curriculum, for example in the art and music programs. In 2009, the Yarram Primary School established a close relationship with a large school (of primary and secondary levels) in Buenos Aires, conceived and established by teacher Marg Beagley, and again embraced by Wendy Bouker and all staff. Telecommunication video links were established and educational materials and gifts exchanged. Calegio Ward school is perhaps the only one in South America which can sing Waltzing Matilda, even though they may be confused with the implications of its words! Teachers from Yarram Primary have attended Argentinian cultural events in Melbourne, and in 2011, teacher Beagley visited the school in Buenos Aires in her own time and at her own expense. The relationship between the schools continues. In 2011, Yarram Primary School was invited by the Victorian Education Department to participate in a three-month study to develop the concepts of multicultural education in state schools. Teachers Wendy Bouker and Marg Beagley represented Yarram Primary school, and on one occasion, four students also represented the school at a forum seeking experiences and ideas. The achievements of Yarram Primary School through the initiatives of teachers such as Bouker and Beagley and the support of principal Penny Earle and all the staff is quite remarkable considering that the school is 200 km from Melbourne, has under 160 pupils, and like many states, has its share of social concerns and administrative time constraints. But the school has demonstrated what can be done with dedication of a few teachers and the support of others. The effort is rewarded by a rounded social education for the children - and great fun for all who participate. The efforts of Yarram Primary School were recognised in November 2011 by the Victorian government with a presentation at Government house of the Victorian Multicultural Education Award, to principal Penny Earle and teacher Marg Beagley. Wendy Bouker, whose passion and initiative in Gippsland started twenty years ago, could not attend on the day due to health reasons. The school continues to embrace multiculturism and the principal and two teachers mentioned remain at the school (2012).